This is not a post about bees (but I might mention them in the course of things). After I was diagnosed with prostate cancer, my urological oncologist suggested I use meditation as part of my therapy. Meditation has been scientifically proven to help people with certain medical conditions, like high blood pressure (which I had) or emotional stress. I had watched my wife meditate for years, but it wasn’t something I thought I could/should do. Leave it to a life threatening situation and advice from someone other than my wife to change my mind. I took up meditating through the Eldorado Mountain Yoga Ashram and found it was something that resonated with me. It took me a while to get into it, but eventually, I settled into a twice daily practice and have been doing that for the past year and a half. My blood pressure went down and I find that I am much more centered in my approach to the world. It helped me deal with the emotional stress of my treatment until I was cured. During our daily lives, our minds are constantly going as we interact with the world. Sometimes it’s not pretty. The goal of meditation is to still the mind so you can search for your Inner Self – which is a state of being described as sat-chit-ananda (being, consciousness and bliss). Yogis have been searching for that Inner Self through meditation for thousands of years. But, meditation is not the property of any religion or nationality – it is universal. There are many different ways to meditate. For example, some Christians use contemplative prayer as a form of meditation. And it’s not something you have to do at a set time, in a special place, wearing special clothes. You can do it anywhere, any time. I frequently use my practice while driving – it’s really cut down on my penchant for road rage. Many times, we seek happiness through the accumulation of stuff, but eventually, the stuff gets old and we aren’t as happy with it, so we get new stuff. In this quest for happiness, we never really find true happiness. Swami Muktananda said, “The truth is that the joy you find in all things is simply a reflection of the joy of your own inner self.” Truer words have never been said. If it was the thing that gave us our joy, then we wouldn’t feel the joy in us when we remember that thing, even several years later. By stilling the mind through meditation and looking inside, you can find that inner joy. Just like anything else, it doesn’t happen right away – it takes practice. You need to practice, practice, practice to build your spiritual muscles. This past weekend, I completed a Level 1 Meditation Teacher training program, another step in my journey. 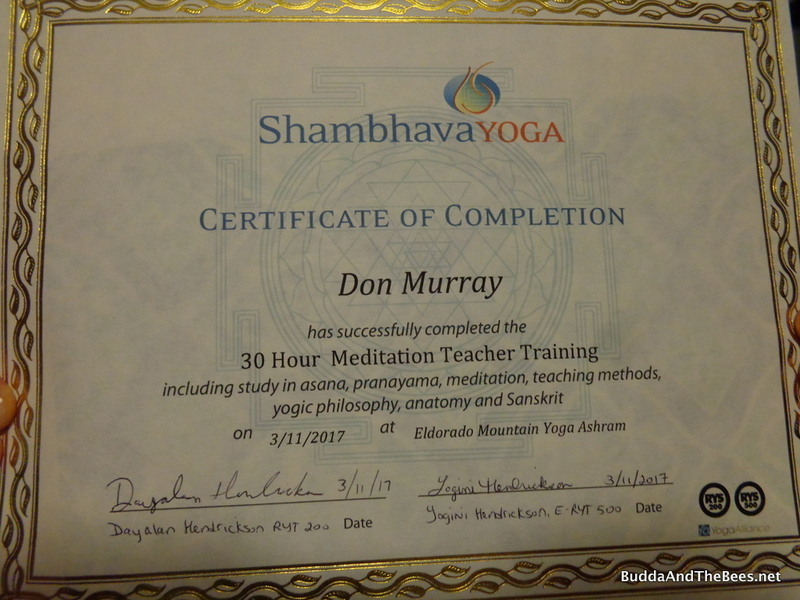 I’m now a certified Shambhava Yoga Meditation Teacher – something I never would have imagined! Besides learning how to teach meditation, it really helped me deepen my own practice. I learned almost as much from my fellow students as I did from my teachers. Most of them had been doing this practice for many years – I was just a newb. Each had a special gift that they brought to the class – it was really amazing to hear their takes on a particular practice or sharing their experiences. I shared some honey and lip balm from my bees with them to express my gratitude for all they taught me. I still have a long way to go on my spiritual journey, but I feel I’ve got a good start. I hope to share what I have learned with others. One of the practices we learned is a gratitude practice which I’ve written about before. For those of us living in the USA, we have so much to be grateful for. Most of us don’t have to worry about where our next grain of rice is coming from or whether we have clothes to keep us warm. We often take these things for granted and don’t spend our energy contemplating gratitude. For the past year and a half, I’ve been spending a few minutes at the end of each meditation session doing a gratitude practice. It’s not always easy – some days I don’t feel particularly grateful. But just the intention, cultivates gratitude. And gratitude begets more gratitude. In our teacher training, we learned to be grateful for the teachers that came before us and gave us these practices. That is something to be truly grateful for. But it got me thinking about other teachers in my life and the gratitude I owe them. They have come from all walks of life – school teachers, co-workers, relatives, beekeepers – all bringing me something to learn. This past Monday would have been my Dad’s 89th birthday. He was an avid skier and last skied on his 85th birthday – a year before he died. To celebrate, my wife and I went to Steamboat and skied on his birthday. I was thinking about all he taught me in life and was grateful for his life and the lessons. 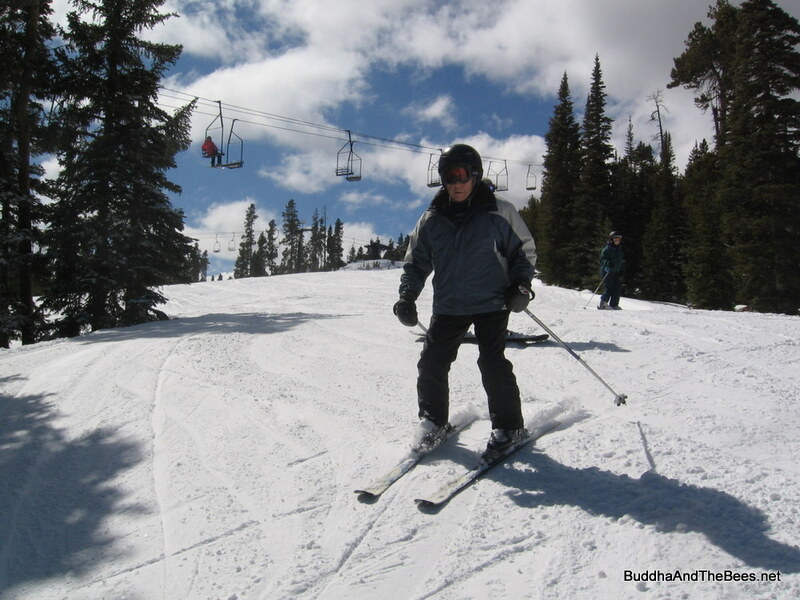 I remember when I was just learning to ski that I was afraid of riding a chairlift. My dad went up the lift with me, trying to make me forget my fear of heights. He told me, “The fall never killed anybody – it’s just the sudden stop at the bottom that gets you.” That actually relaxed me. I learned many other lessons from him and give thanks for him (and my mom) almost every day. I missed skiing with him, but know that there’s more skiing for him in the next life. So, for all the teachers in my life, the good times and the bad which have all led me to this point, I just have to say, “Thanks”. And I look forward to new teachers and life lessons in the future. Your quote from Swami Muktananda is priceless. And your own description of how to reconnect with inner joy is quite the gem. A very valuable testimonial of your journey and the anchors you have found, Don! Thanks, Eric. We’re all on a journey! Beautiful post! You’ve been through the wringer, and this recounting of your journey to inner peace and joy is wonderful. Especially enjoyed the part on gratitude. My personal belief is that love is the creator and origin of all things, but gratitude is what keeps the universe in order. Thank you for sharing your story (and congrats on the certification)! Thanks, Julie! Love and gratitude go hand in hand!